The aging Robin Hood, for twenty years now the Earl of Huntingdon, rides into Sherwood and blows a horn to summon his old comrades. Mounted bandits with bows come riding out of the woods, waving their weapons, all galloping, gathering, scores of them…. Geez, there are more horse archers in Sherwood Forest than the Mongols had in the Golden Horde. Once assembled before Huntingdon, the earl reveals that he’s called them all together … for exposition! The King of England is a child, a royal regent governs in his name and is convening a meeting of nobles, where the earl suspects he wants to revoke the Magna Carta! But don’t worry, Huntingdon has sent for his son Robert, so thanks for galloping, Merrie Men, now go chill for a day or two. Huntingdon arrives at the meeting of nobles, and as soon as he sees that the regent is played by Henry Daniell, he knows the deal is going down. In short order the Magna Carta is rescinded, tyranny is ascendant, the regent plots to usurp the throne, and the uncooperative Earl of Huntingdon is banished. And the next day Robin Hood is back in Sherwood, organizing the resistance. 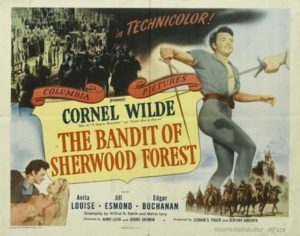 This movie is pretty standard Robin Hood fare, the kind of thing we’re going to see a lot more of between now and 1960 or so. The twist this time is that the older and now silver-haired Robin (Russell Hicks) is relegated to the background, while his son Robert (Cornel Wilde) takes point handling the derring-do. Young Robert is virile and active, but kind of an arrogant jerk at first, trouncing the older Merrie Men while sparring, snatching kisses from unwilling ladies, and being a general show-off. But really, Robert just needs a serious challenge, like saving the young king from the unscrupulous regent, and he’ll straighten right out—especially if he listens to that smart lady he stole the kiss from (Anita Louise), because she’s going to save his neck when he gets captured and thrown into the Nottingham Castle dungeon. Fortunately, Nottingham Castle has the worst postern gate security protocols ever. So this picture’s not bad, but it has this weird and unexpected flaw: it keeps forgetting it isn’t a Western. The extras all sound like cowboys, everybody has horses and gallops everywhere riding Western style (there’s so much riding), and it’s clear that the cast and crew, who were making a Western just last week, are really looking forward to getting out of the green tights and making another Western next week. At least there’s a final duel between Cornel Wilde and Henry Daniell, with their giant shadows fencing across the castle wall behind them. Because traditions, after all, must be upheld.